While the CFA Institute has published Global Investment Performance Standards (GIPS) for years, there has never been a serious discussion of their implementation and best use. In this new book, that void is filled, and you'll quickly discover how to calculate, present, and interpret investment performance conforming to standards that are currently used in over thirty countries worldwide. Covering both the mathematics of relevant investment statistics and the policies and procedures for achieving and maintaining compliance, this book is a comprehensive guide to successfully using GIPS standards in today's turbulent investment environment. 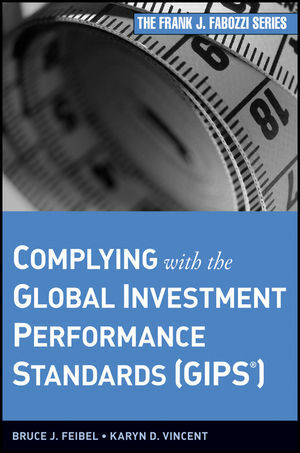 If you're in the field of finance, Complying with the Global Investment Performance Standards (GIPS) is a book you need to read. Bruce J. Feibel is Managing Director of Investment Manager Products at BNY Mellon. Formerly, Mr. Feibel was Chief Strategy Officer for Eagle Investment Systems, a BNY Mellon company. Prior to this he was a principal at State Street Global Advisors. He is also the author of the book Investment Performance Measurement, published by Wiley. He earned his B.S. in accounting from the University of Florida. Feibel is a CFA charterholder, a member of the GIPS Risk Standards Working Group, and a past member of the CFA Institute Investment Performance Council. Karyn D. Vincent is the founder of Vincent Performance Services LLC, a provider of GIPS verification and consulting services. Prior to this, she was a partner at PricewaterhouseCoopers and was responsible for the firm's verification practice globally. Vincent currently chairs the GIPS Interpretations Subcommittee and is a member of the GIPS Executive Committee. Previously she chaired the GIPS Verification Subcommittee. Vincent earned her B.S. in accounting from the University of Massachusetts Dartmouth, and is a CFA charterholder and a CIPM certificant.